Come for fun to the ‘Explore the Trades’ Camp. 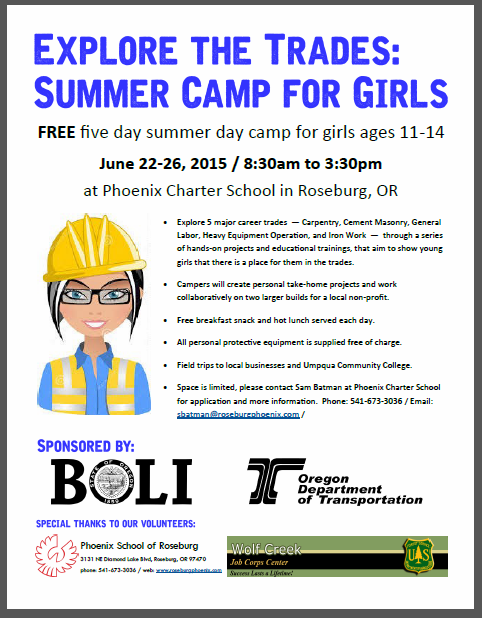 This five-day camp will operate on our campus in East Roseburg the last full week in June 2015 and open to middle school age girls (11-14 years of age). We will present career pathway information, hold hands-on skill workshops, and guarantee fun as we explore construction trades and other OSATC-approved Pre-Apprenticeship Programs. Girls will be fed lunch, receive free hardhat/gloves, and explore the trades working life!